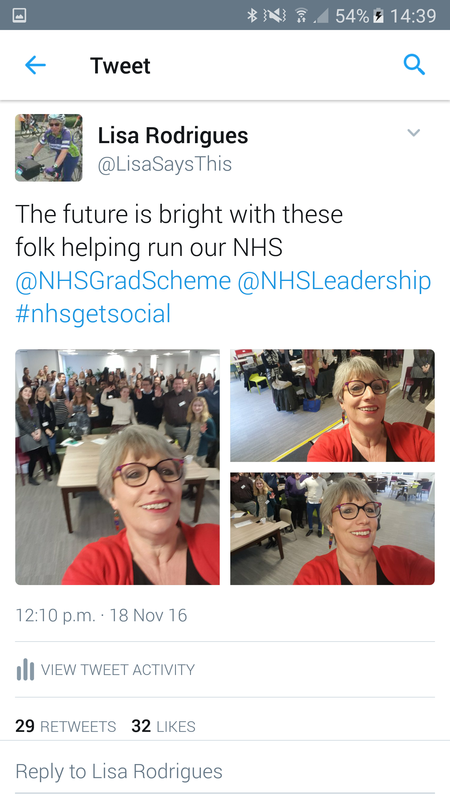 On Friday I spent a morning in Leeds with 100 trainees from the 2015 and 2016 intakes of the NHS Graduate Scheme. 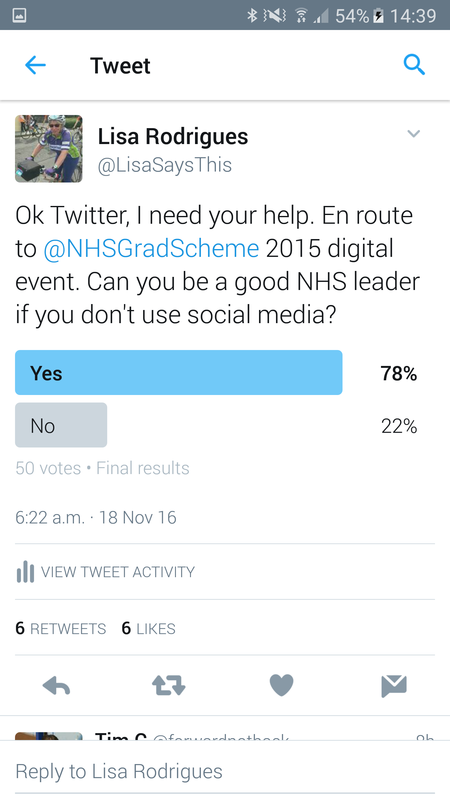 They had arranged a conference about digital media #NHSGetSocial. Thank you @DanielOyayoyi and @RebsCullen for inviting me to talk about raising awareness via social media. That I, an ageing Baby Boomer, should address a group of Digital Natives on this subject felt hilarious. As so often these days, I gained much more than I gave. The audience seemed to agree. They could think of examples of leaders who seemed uncomfortable with social media using it poorly, mainly to broadcast rather than interact. There were also differences between how those with extrovert and those with introvert personality preferences interact with social media. Some had very sensible anxieties about tweeting first and regretting later. And others were honest about how hard they found it to decide what, if anything, to say via social media. Don’t rise to the bait or tweet when angry or under the influence of dis-inhibitors. Share opinions but remember they are only your opinions. Others may disagree. 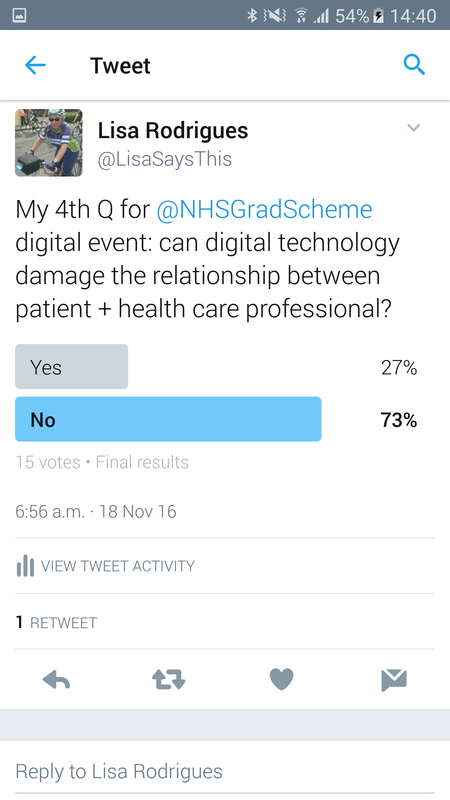 The audience also seemed to agree with the Twitter response to my second question. We talked about the Daily Mail and other media that love to name, blame and shame politicians and those who work in public services but seem much less keen to call out wealthy tax avoiders or those who “create value” by paying minimum wages and offer zero hours contracts. And how even when they get things wrong they rarely apologise. We talked about agent provocateurs and others who make things up and then either delete them or simply deny they have said it, even when there is photographic evidence to the contrary. The conspiracy theorists who lap this stuff up. And the anonymous characters who lurk on comments pages and bang on about no smoke without fire. 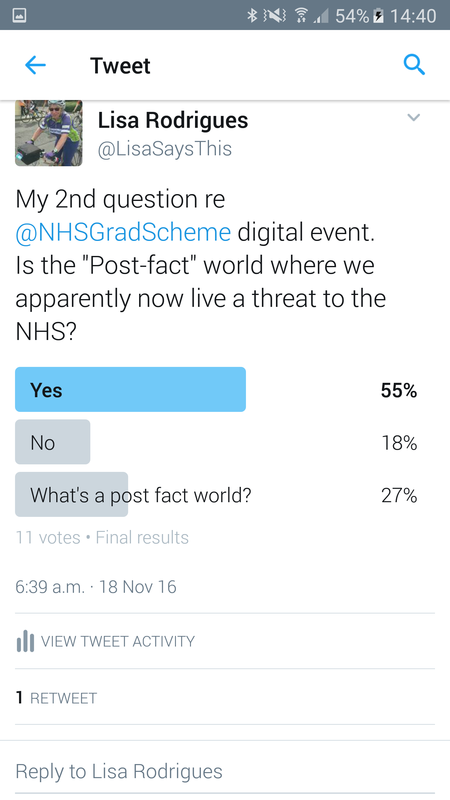 And we talked of the damage this all does to those who dedicate their lives to working in public life, but also how clinicians and managers can work together to call this dishonesty out, live by their values and counteract the post-fact world poison. 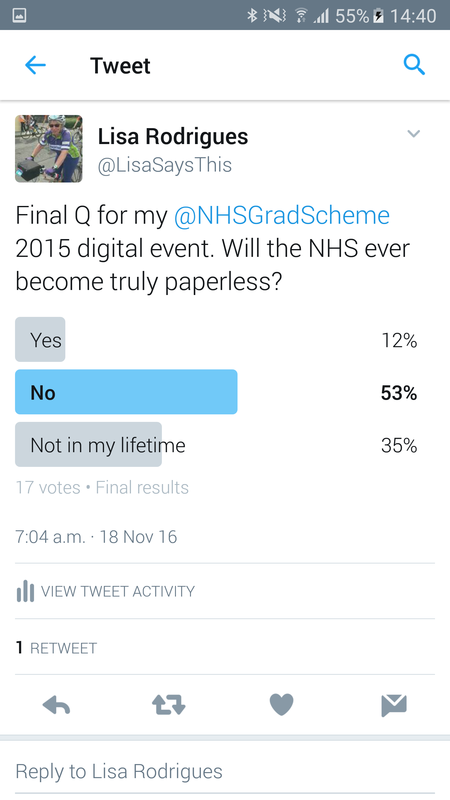 My other three questions were about patients and a paperless NHS. 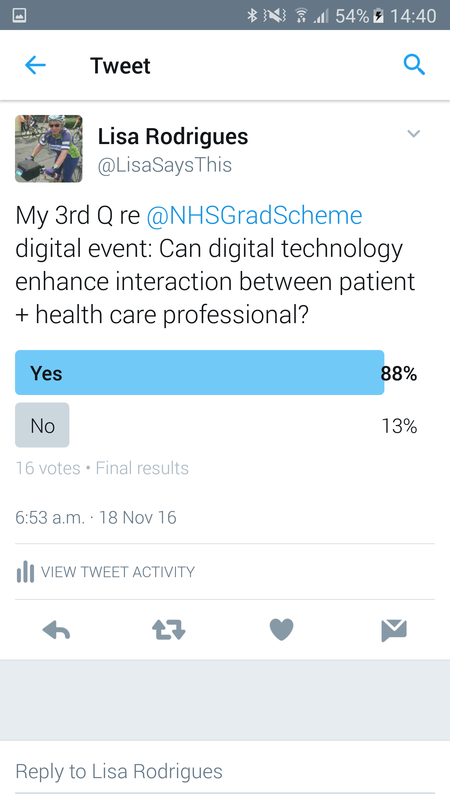 Again, although hardly a representative sample, my Twitter replies accorded with the audience. They said that attitudes mattered as much if not more than IT. 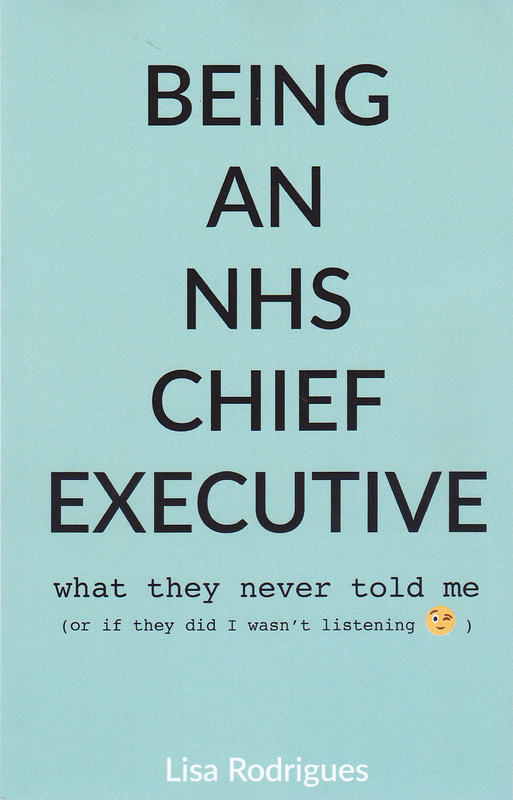 I told them the story of a medical colleague who would write to me every six months or so during my 13 years as an NHS CE listing everything that he felt was wrong with how I was leading the trust, including the inadequacy of his secretarial support, in a 3 -4 page letter typed, somewhat ironically, by his secretary. I would always reply, by email. By contrast, my own psychiatrist, a world renowned professor at another trust, personally typed his update letter to my GP during our consultation and gave it to me to pass on. He would have used email but it wasn’t yet sufficiently secure. We also discussed the pros and cons of clinical staff spending increasing amounts of time away from patients collecting and recording data that someone somewhere thought might be useful. And that the gold standard of a fully connected wireless NHS when patients and staff freely shared information via iPad or other tablet device would happen one day. But that given the current state of connectivity, they probably shouldn’t cancel the contract for supplying paper and pens anytime soon. Finally, I shoehorned in a reference to my muse Mary Seacole. I said that she, a 19th century health care entrepreneur, would have loved social media. 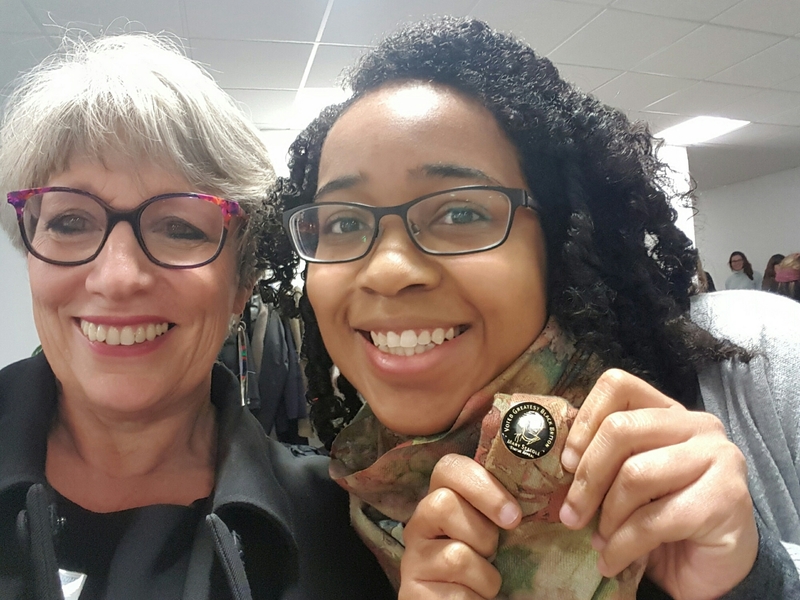 And I gave Daniel and @HPottinger, in the picture below, my last two Mary Seacole enamel badges. At the end I said that I would be writing a blog about the day. And I really hope some of them read it. Because those 100 young people made me think. Despite the financial challenges, morale problems, almost infinite demands plus the debilitating impact of our post-fact world, I think the NHS may be OK.
And you know why I think that? Because these young leaders, and thousands of other clinicians and managers like them, will make it so. With shining integrity, stunning academic AND emotional intellect, insatiable appetite for understanding, capacity for working smart as well as hard, courage to speak truth to power, and wisdom far beyond their years, they will do it. They will help our creaking NHS adapt for the new era. Whilst holding hard to our core values of high quality, safe care for all, regardless of ability to pay. And as one who is likely to need a lot more from the NHS in the future, that makes me very happy. I haven’t read every article on the demise of Kids Company. But I’ve read a few. They seem to fall into two categories: how terrible that this should have been allowed to happen. Or that its founder and chief executive Camilla Batmanghelidjh had it coming. The truth will invariably lie somewhere in between. I saw Batmanghelidjh speak at the NHS Confederation Conference a few years ago. I was an independent director of the organisation and felt uncomfortable, not so much for the paucity of her delivery (she read her speech of mostly incomprehensible psycho-babble and didn’t connect with what should have been a supportive audience) but more because of her intemperate, unjustified attacks on the services provided by some of our members. They had no right of reply. 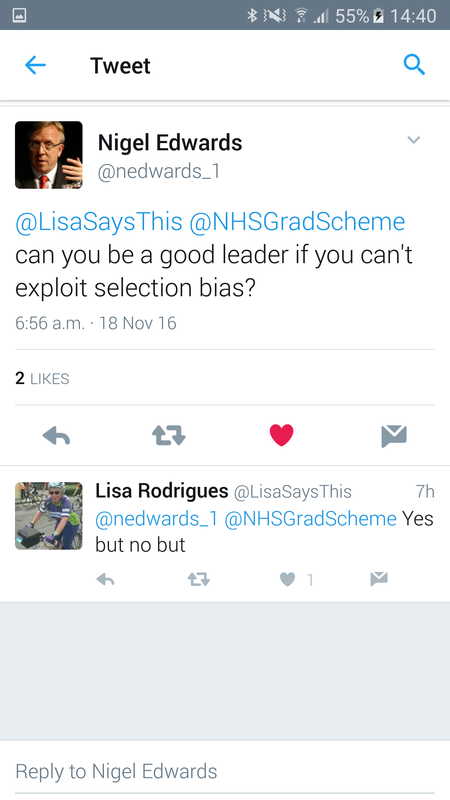 Nor did they enjoy her freedom to act outside clinical guidelines or good governance. The following year I met a member of her executive team at another event. Again, psychological gobbledygook was passed off as groundbreaking work. The speaker couldn’t enumerate how many young people were being helped or what this nurturing cost or even consisted of. But she urged us to meet Batmanghelidjh, and appeared to be more than somewhat in her thrall. I also read a recent leadership article in which Batmanghelidjh spoke in her own words of her legendary poor administration skills, how she needed not one but 5 PAs to keep her organised, and that her office was an extension of her large, warm personality and had been decorated accordingly. The photographs supported this and I recall wondering who had paid for the extraordinary artwork and upholstery. I have been a trustee of several charities. And it doesn’t matter how small or niche you are, the first rule is that you must follow the rules of the Charity Commission and work towards creating a surplus which will act as a cushion should something go wrong with your funding or some other disaster occur. Small charities should have at least 3 months operating surplus available in cash, larger ones a minimum of 6 months. Why the trustees at Kids Company thought they were exempt from such sensible precautions is hard to say. Alan Yentob and the other trustees must carry a considerable burden of responsibility for the sudden collapse of this high profile charity. Many people are rushing to put the boot in, as well they might given the patronage Batmanghelidjh enjoyed from senior members of the government and warm-hearted celebrities. This is no doubt fuelled by jealousy because she was such a smart operator. The sight of her continuing to attack and blame dark forces for her fall from grace throws some light on how she used guilt and guile to attract money for a cause that most of us struggle with, i.e. the mental health of children and young people. Nevertheless, we need mavericks like her. She may have been economical with the truth about how many young people Kids Company helped. And what they did there may have been less than mainstream. But she has highlighted that there are young people that traditional services are simply not reaching, and that these services are in any case stretched beyond all limits. For that we should applaud her efforts. I hope that the young people Kids Company helped will find support elsewhere. And that we all wake up to the fact that, if we don’t invest significantly in the mental health of our young people, we are setting the whole country up to fail. Camilla Batmanghelidjh and others at Kids Company should be considered on their record. Let’s wait for whatever reviews that eventually come out, and not judge any of them, kindly or harshly, until then. In a previous life, I ran a mental health trust for 13 years. It was really hard, but it brought some influence to bear on something that matters very much, i.e. the experiences of 1:4 people, who, like me, are sometimes mentally ill. In 2010, as Chair of the Mental Health Network, I shared a platform with Health Minister Paul Burstow, Paul Jenkins, then of Rethink, Sarah Brennan of Young Minds and others at the launch of the coalition government’s mental health strategy No Health Without Mental Health. In 2013, I met Norman Lamb (who took over the ministerial role in 2012) and a few other senior colleagues to discuss why it was that the strategy hadn’t completely worked, in our opinion. The shocking evidence of widespread disinvestment in mental health services was by then becoming clearer, rigorously uncovered by investigative journalists Shaun Lintern (HSJ), Andy McNicholl (Community Care) and Michael Buchanan (BBC). Who are heroes in my opinion. In times of plenty, mental health services have received at least a small share of extra resources available. Professor Louis Appleby’s excellent National Service Framework was delivered from 1999 – 2009 through increased investment in crisis services, early intervention and assertive outreach teams. And it was strictly monitored. Commissioners and/or trusts who thought they knew better than the best evidence of what underpinned compassionate, effective care for people with serious mental illness were found out and given no option but to improve. The architecture that did this monitoring has since been dismantled. We are left with regulation, inspection, adverse incident reporting and stories in the media. The pressure by local commissioners on providers to swallow the current disinvestment medicine is considerable. Mental health leaders who make a fuss are viewed as lacking loyalty to their local health system. Were the same cuts made to cancer or heart services, there would be national uproar. This tells us something, which is that stigma towards the mentally ill is alive and kicking within the NHS. 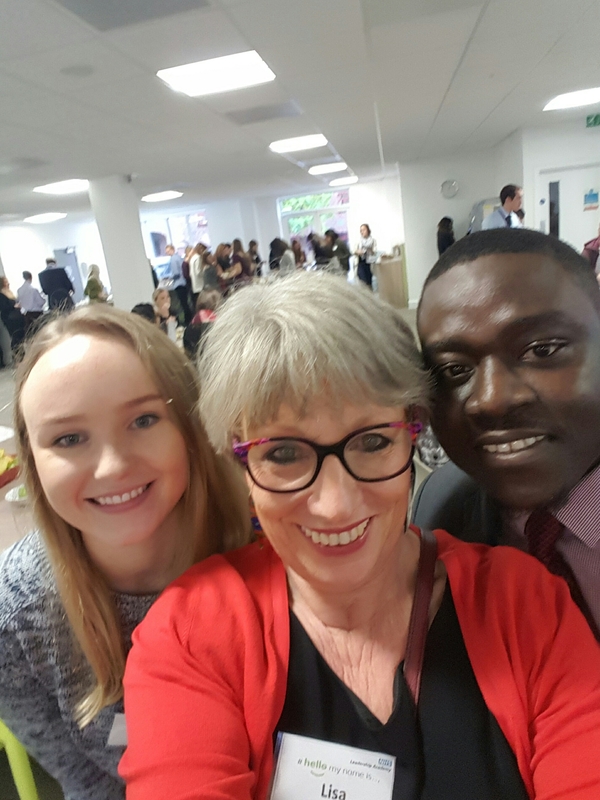 A true story: the other day, I mentioned the wonderful Alison Millar’s Kids in Crisis programme to someone senior from NHS England. I could tell they were irritated to be reminded that very sick children are currently languishing in police cells or being shipped hundreds of miles around the country while desperate clinicians spend hours trying to find a bed. This person actually said that parents are prepared to travel all over the world looking for the best treatment for conditions such as cancer. 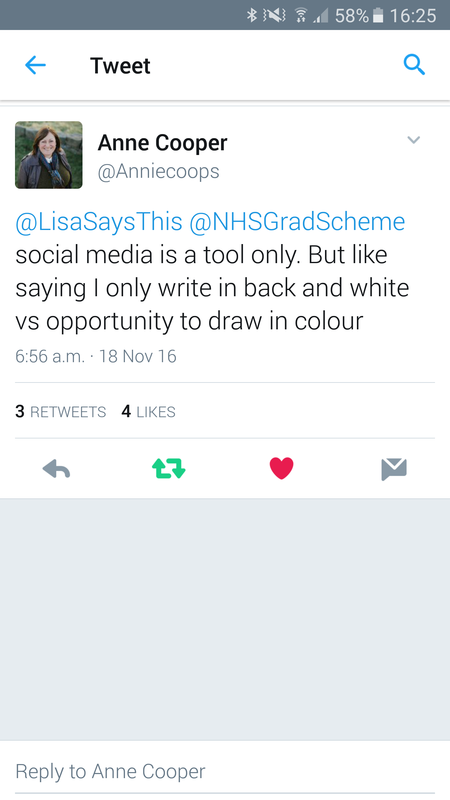 So why should CAMHS be different? When I reminded them that this wasn’t about highly specialist care, just access to care anywhere, they blamed the failure on local services and moved on to share their insights with someone else. So we have denial about the impact of disinvestment, as well stigma. And I realise that in my new freelance world, I have a different sort of influence. Thanks to Paul Jenkins, now CE of the Tavistock and Portman Trust, for his blog this week on the paucity of investment in mental health research. Another example of how stigma is flourishing towards those least able to argue for resources. And to Andy McNicholl for his piece on the bed crisis in adult mental health services, mainly caused because people are being hospitalised when other services have closed, or there is nowhere safe for them to go when they are ready for discharge. Regarding the NHS Five Year Forward View (5YFV) here’s my 6-point plan for making mental health more mainstream. With measurements. Because if you don’t measure, you can’t manage. Make suicide prevention the business of every citizen of the UK. Stop blaming mental health trusts and their staff for failing to keep people alive. The responsibility is much broader than that. Locate suicide reduction planning with Health and Wellbeing Boards. Make it their number one priority, with proper support as well as sanctions for lack of progress. Expect every provider and commissioner to make the care of people who happen to experience mental illness their explicit business. Start with primary care. Require every NHS employee, including reception staff and everyone who works in a commissioning organisation, to do a minimum 1/2 day training, with an annual update, delivered by experts by experience. Report on compliance via the annual NHS staff survey. Require local systems to produce integrated commissioning plans for all primary and secondary services. Particularly crisis care; dementia; all major physical conditions such as heart disease, strokes, obesity, diabetes and cancer; neurological conditions such as MS and MND; and musculo-skeketal conditions including chronic pain. Draw on the RAID model for measurement. Allow organisational form to flower according to local need. But also require investment in integrated services through an annual reduction in organisational overheads, and increased investment in the third sector. Reduce premature death rates in people with serious mental illnesses of up to 25 years by making mental health promotion core business for primary care and secondary health providers in the statutory and non-statutory sectors. Target supportive, evidence based obesity reduction, smoking cessation, substance misuse harm reduction and exercise programmes for people with diagnoses such as schizophrenia, bipolar disorder, PTSD and personality disorder. Set ambitious targets over the next 25 years and monitor hard against them to help turn around the life chances of some of the most marginalised people in society. It is up to the NHS to articulate and prove the business case for a change of approach in welfare for people with long term conditions such as serious mental illnesses. Commission the best brains eg Professor Martin Knapp at LSE to put the evidence together. Which is that it is considerably more costly as well as more cruel to condemn people who experience mental illness to poor, insecure housing and limited, insecure income, and for them to appear frequently and often pointlessly within criminal justice services. But these costs do not occur in one place. Creating exciting opportunities for engagement and volunteering such as The Dragon Cafe can help people move from being recipients to full participants. Placing employment specialists within mental health teams and incentivising pathways into work are also proven to be highly successful. The alternative, i.e. penalising those in need of help, is counter-productive. It forces people to have to make themselves appear less able, makes them reticent about coming off benefits for fear of never getting them back should they need them in the future, as well as being extremely detrimental to their long-term well-being. Shine a light on why so little is spent on mental health research, given the financial and life chance costs of mental illness. Do something serious ang longlasting to reverse this. And then measure the impact longditudinally. No-one says we’re spending too much on cancer research, do they? Use that as our benchmark. AND listen to the eminent and brilliant Professor Don Berwick, who makes the point that inspection never improved any health system. We need to invest in improvement science, architecture and skills for the whole NHS, of which mental health is an intrinsic, integrated part. 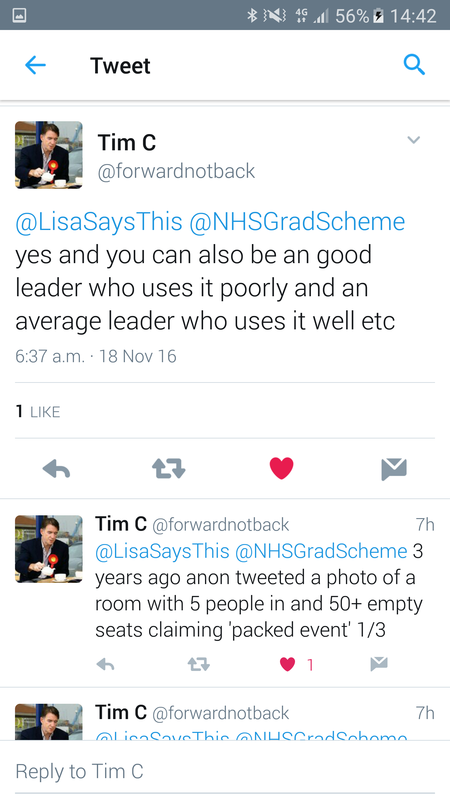 Calling something NHS Improvement doesn’t necessarily make it an improvement body, by the way. But it is a good start. I’ve shared these thoughts with the fabulous Paul Farmer, CE of Mind, who is leading one of three national task forces set up to help deliver the NHS England 5YFV. The other two are on cancer and maternity care. I know he wants to do the best he can. But he needs your help. If you are part of the mental health family, and I would argue that every human being should be, please join in. Let’s seriously increase our ambition for those of us who experience mental illness, and focus hard on a small number of really important things that will really change lives. And then let’s concentrate and not squabble amongst ourselves as we set about achieving them. That’s how winning teams win, against all the odds. Suicide is one of the last taboos. So much so, that some internet service providers (ISPs) block websites that name it, for fear they are pro-suicide or that just mentioning the word may somehow encourage it. Even my little blogsite has been affected. Thanks to those who told me about two ISPs who were blocking me, and to BT who fixed it fast. And thumbs up to Virgin Media whose initial excuses were unimpressive, but who sorted it out eventually. I was thinking of the taboo of suicide when I met some wonderful people in Devon recently. Some had been directly affected by suicide, such as the couple who lost their 18 year old son in 2011 and now campaign to raise awareness, and promote a young people’s helpline and two excellent training courses, Safe Talk and ASIST via suicide prevention charity Papyrus. Some were like me and experience suicidal thoughts from time to time. And some were just good, kind people who help others in their chosen careers or as volunteers. They are all part of the South West Suicide Prevention Collaborative. I shared some of my personal story with them and why I believe now more than ever that preventing suicide is everyone’s business. It is definitely not just the responsibility of staff who work in mental services, who can get blamed for not keeping someone alive, rather than praised for all the times that they have. Staff need support at such times because they feel devastated at the loss of a patient who they care about deeply. How can we expect them to be compassionate to others if we treat them with so little compassion? Actually, this applies to all of us. Telling people who work in public services to be more compassionate while treating them without dignity, respect or kindness is the ultimate irony. And yet it is played out in many places every day. Including much of the media. I said something at the event that isn’t currently fashionable. I don’t think it is is possible to prevent every death by suicide. But I do think that we can do very much more IF we make suicide prevention the business of families, friends, neighbours, schools, workplaces, all public services rather than just the obvious ones, the media, shops, cafes, bars, the voluntary sector, faith groups, social groups, sports clubs…everyone. And if we talk about it with more understanding and less rush to judgement, I believe we will gradually lose the taboo. But we still have far to go. It isn’t just those of us who experience mental illness who think about killing ourselves. Death of a loved one, job loss, other sorts of loss, crippling debt, loneliness, isolation or an overwhelming sense of hopelessness about the future can all be causes. One of the people at the Devon conference spoke bravely about the corrosive impact of the downturn and benefit changes on those who are least well-off. Only those who have been directly touched by suicide can possibly know just how raw and awful it feels. It is a grief like no other, because of the guilt and the shame that is still associated with it. I don’t get cross about those who still describe the act as “committing” suicide. They usually mean no harm. Suicide hasn’t been a crime since 1961, but we have some way to go to incorporate that change into our values, attitudes, behaviours and language. I have spent a lot of my life being ashamed of having occasional suicidal thoughts. I was lucky to learn about Samaritans via an article in Reader’s Digest when I was 15, the same year I saw my first psychiatrist. Their kind, wise volunteers have helped me several times in the past. I even became one myself for a while in my early 20s. But I was going through a rough patch and left without explaining why. Now it’s payback time. I’m doing a big bike ride to raise money for Samaritans. Apart from a handful of staff at their HQ, all Samaritans are volunteers. Like the two lovely women who spoke at the Devon event about the work they are doing in local schools to raise awareness and offer support in the event of a death by suicide. I am donating my £500 fee from the event this week towards my fundraising target. Every penny I raise will go to keep local branches across the country running and to pay for the calls desperate people need to make. I have a big birthday in August. I’m asking my family and friends to make donations in lieu of presents. I can’t think of a better way to celebrate reaching 60. We can all help one another. That man sitting on the station platform all alone? How long has he been there? Could you get over your reluctance to appear interfering and take a moment to ask him how he is? What about the elderly neighbour whose partner has recently died and who hasn’t been seen for a while? The young person at work who takes frequent days off? The friend who has been made redundant? Even the chief executive who has apparently made a mistake and is getting a mauling via social media. We can all do our bit to be kind, because that is all it might take to save a life. And as we say at Grassroots, the wonderful suicide prevention charity in Sussex of which I am a trustee, here’s to life. Yet I became tetchy on reading the Liberal Democratic manifesto mental health promises yesterday. It feels a bit rich that a party that has been in power for a full parliamentary term, albeit as a junior partner in a coalition, should be making promises now after 5 years of not making these things happen. I:4 of us will be mentally ill in any one year, according to the Mental Health Foundation. Yet mental health services are still the poor relation within the NHS family, missing out on new money and bearing the brunt when public sector “efficiencies” are required, as they have been during the last parliament. Under the coalition, this imbalance has grown measurably worse. The funding promises made in yesterday’s Lib Dem manifesto will to some extent redress the balance – but only if they come to fruition. I will need persuasion to believe that we will see this money, given the promises made in 2010 not in the last Lib Dem manifesto, but after the coalition government was formed. I was chairing the Mental Health Network of the NHS Confederation at the time, and was invited to speak at the launch of the coalition’s mental health strategy alongside Mr Lamb’s predecessor Paul Burstow. We felt excited and optimistic that parity of esteem between physical and mental health services was being promised at the start of the new parliament and ahead of any other health announcements. What happened? Children’s mental health services, one of the top priority areas in the manifesto, are in a state of particular crisis. This is because of cuts to local authority funding of front-line services in schools and those provided by the third sector, reductions to NHS community services, substantial increases in referrals linked in part to the downturn but also modern pressures felt by young people. There has been near-chaos in the commissioning of these services arising from changes to the NHS and Social Care Act, which although a Conservative-led initiative which they now admit was a mistake, could have been halted or at least improved by the Lib Dems. One of the most troubling outcomes is that sick children now wait regularly in police cells while desperate clinicians and managers scour the country for a suitable hospital bed. Staff are overwhelmed, and parents are desperate. Given that 75% of mental illnesses start, as mine did, before the age of 18, and that early intervention is now known to make such a difference, this situation is not only cruel, it is also extremely short-sighted. According to W Edwards Deming, if you don’t measure, you can’t manage. Mental health services have been crying out for a commissioning currency so they aren’t expected to respond to infinite levels of demand under open-ended block contracts. They need national benchmarks, targets and some form of payment by results, otherwise bids for increased funding will continue to be trumped by those for diseases such as cancer or heart disease, where there are a wealth of measurements. This was promised by the last Labour government in 2005 and by the coalition in 2010. It appears again in this manifesto; if the Lib Dems help to form the next coalition, will we be third time lucky? Here are Royal College of Psychiatrists’ President Professor Sir Simon Wessely and Time to Change ambassador Alastair Campbell explaining why in their view, when it comes to mental illness and mental health care and support, government actions speak louder than words. It’s not just the 1:4 of us who experience mental illness who should carefully consider these promises and those made by each of the other political parties. 4:4 of us will be voting on May 7th, or rather, we have the right to vote that others have died to get for us. This will apparently be the closest election in a lifetime. We have the greatest ever diversity of candidates. If we don’t each exercise our democratic right, we risk allowing those more certain than us about matters as important as mental health to decide who will run the country. According to pundits, the outcome of the election is likely to be another coalition with at least two parties. This time, whoever forms the new government, I intend to make a fuss right from the beginning about funding and evidence-based support for mental health services. The more of us who do, the more they will realise that we mean business. The recent dog-whistle headlines about the aircrash co-pilot show that we have a way to go in tackling the stigma of mental illness. So please ignore Russell Brand and vote; being disenfranchised would be really bad for our mental health.